New book, 336 pages. This book traces the transformation of Venice from a proud independent state into a dazzling dreamscape that attracted artists, writers, and composers from arround the world. 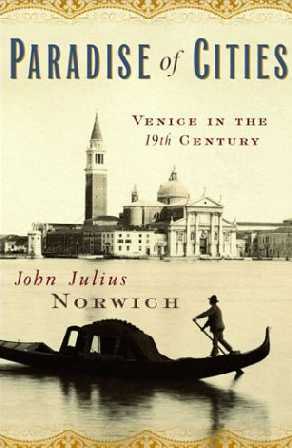 In a strikingly effective departure from straight narrative history, the author tells the story of Venice through the experiences and reactions of such famous 19th century visitors as Napoleon Bonaparte, Lord Byron, John Ruskin, Henry James, Richard Wagner, James Whistler, and Robert Browning. Napoleon, having achieved the conquest that had thwarted other forces for a thousand years, was totally indifferent to the glories of his prize. The almost commically lascivious Byron seduced seemingly every woman in Venice until he had the misfortune of falling in love with one of them, and the prim Ruskin obsessively sketched every architectural detail for his seminal book - The Stones of Venice - even as his comely wife grew weary of his celibacy. Wagner worked on Tristan and Isolde in Venice, and Whistler painted his greatest masterpiece there.